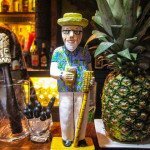 Check out our calendar for all the major events across the world of Tiki culture, updated continually throughout the year. 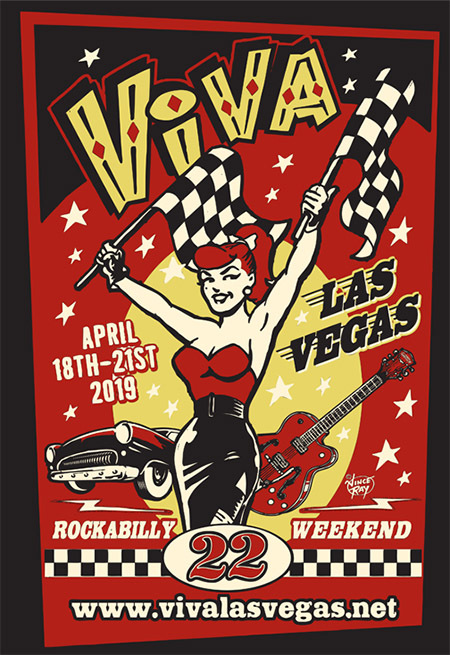 April 18-21 – Viva Las Vegas rockabilly weekend. 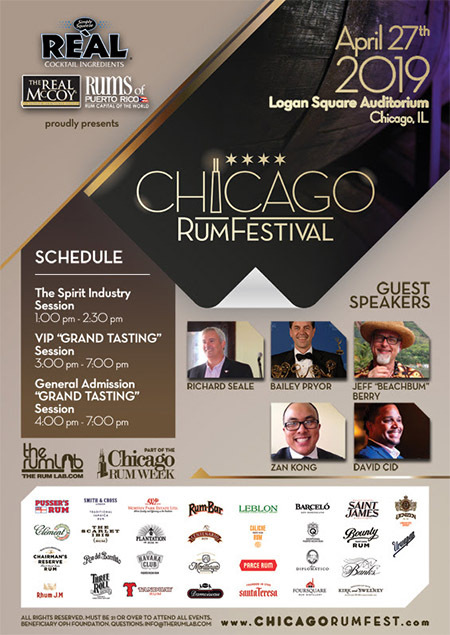 April 27 – Chicago Rum Festival. 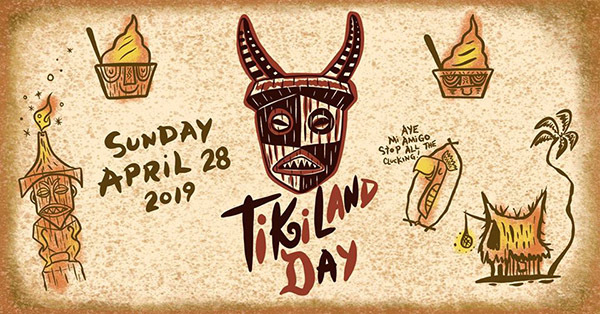 April 28 – TikiLand Day at Disneyland in Anaheim, Calif.
May 16-19 – Tiki Caliente in Palm Springs, Calif.
May 17-18 – Rum Renaissance Festival in Coral Gables, Fla.
May 18 – Czech RumFest in Prague, Czechoslovakia. 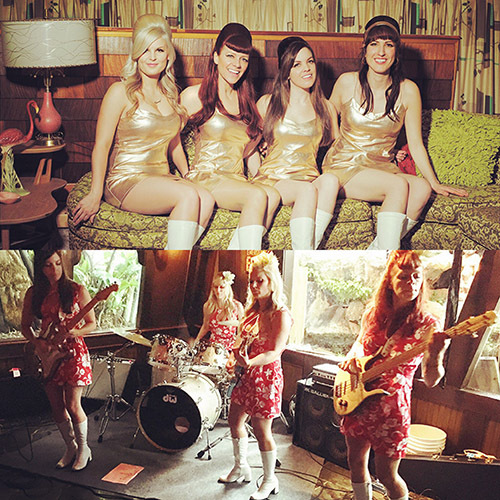 May 23-26 – Nashville Boogie vintage weekender and car show. May 25 – Club Rum in Amsterdam, The Netherlands. May 27-30 – International Rum Conference and Madrid Rum Festival in Spain. 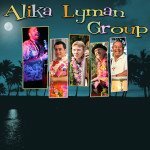 June 5-9 – The Hukilau in Fort Lauderdale. 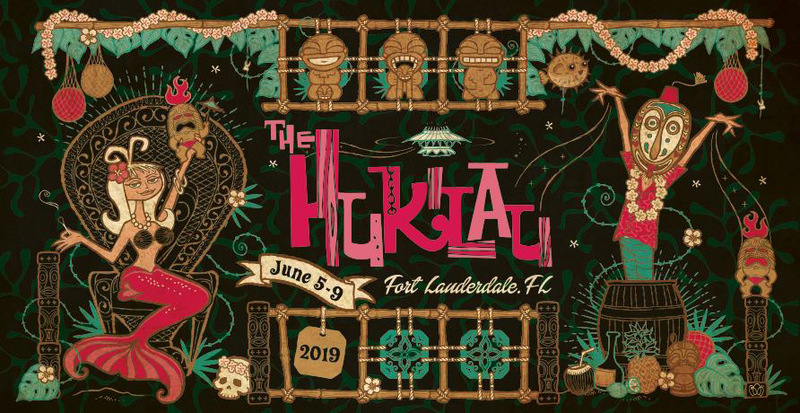 NEW: As The Hukilau fast approaches its 18th annual Tiki weekender in Fort Lauderdale in June, hotel rooms at the host Pier Sixty-Six have sold out, and the more popular classes and symposiums are filling up. 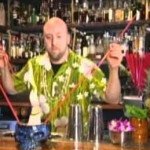 But new events are still being added, including a cocktail class on the rums of The Mai-Kai hosted by The Atomic Grog. Meanwhile, news just broke that Pier Sixty-Six will be closing for a massive two-year renovation immediately after The Hukilau 2019. 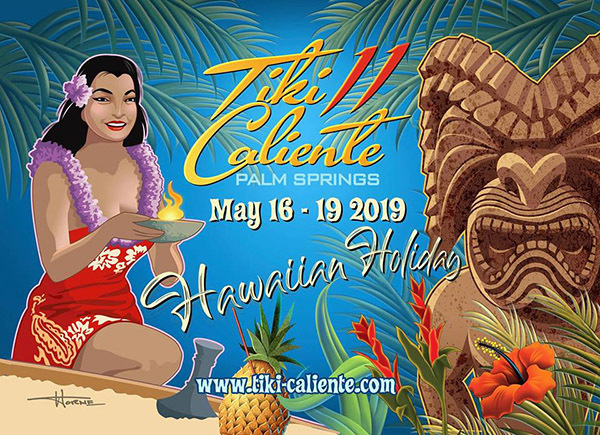 With plans for a new 2020 site for The Hukilau already underway, this June should prove to be a final opportunity to party at the vintage Pier Sixty-Six, Tiki style. 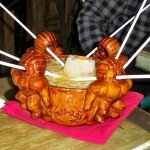 June 7-8 – Rum Love Festival in Wroclaw, Poland. 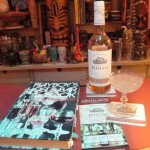 June 8 – Manchester Rum Festival in the UK. 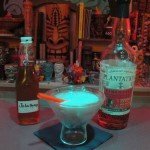 June 9-16 – Dallas Tiki Week. 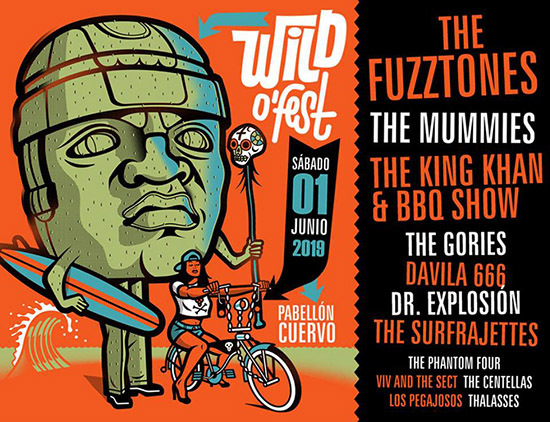 June 10 – Wild O’ Fest in Mexico. 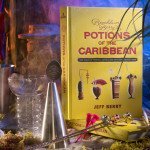 June 15 – New York Rum Festival in New York City. 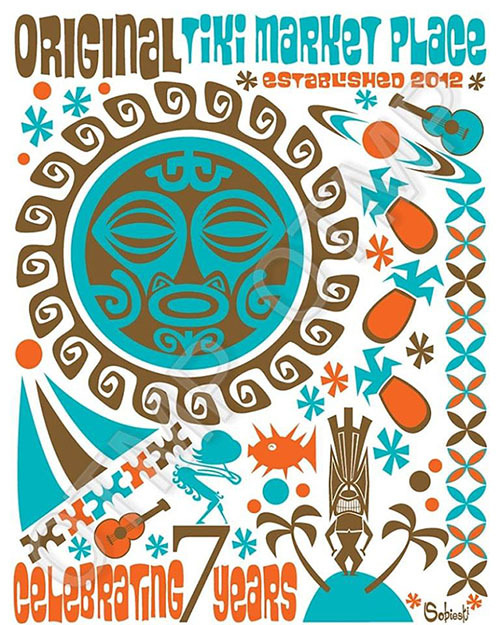 June 20-23 – Surfer Joe Summer Festival in Livorno, Italy. 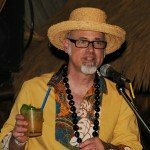 June 27-30 – Ohana: Luau At The Lake at The Tiki Resort, Lake George, N.Y.
July 5-7 – Tiki Kon in Portland, Ore.
July 16-21 – Tales of the Cocktail in New Orleans, La. 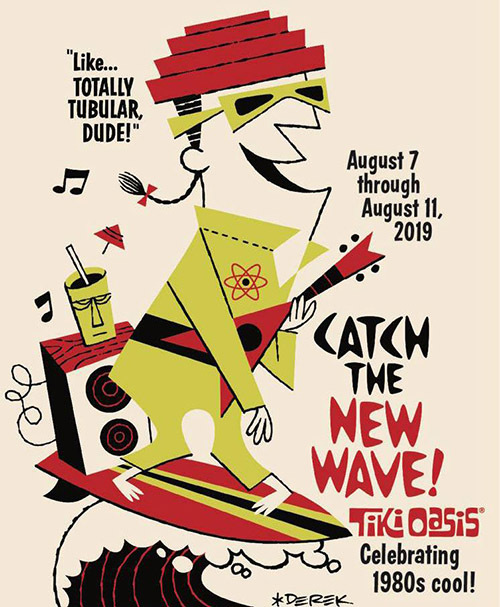 Aug. 3 – Surf Guitar 101 Convention in Torrance, Calif.
Aug. 7-11 – Tiki Oasis in San Diego, Calif.
Aug. 16-18 – Hi-Tide Summer Holiday: Asbury Park in New Jersey. 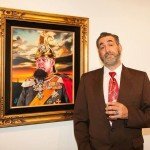 Aug. 31-Sept. 1 – German Rum Festival in Berlin. 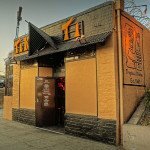 Sept. 7 – California Rum Festival in San Francisco. 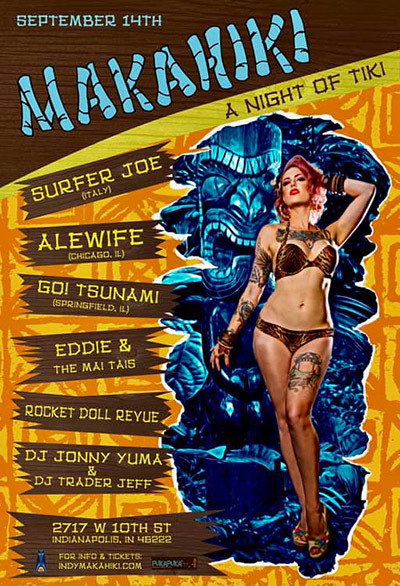 Sept. 14 – Makahiki: A Night of Tiki in Indianapolis, Ind. 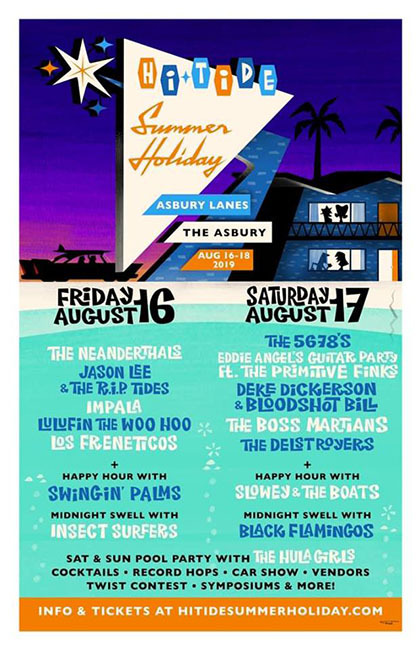 Sept. 20-21 – Southern Surf StompFest in Atlanta. Oct. 19-20 – The UK RumFest in London. Nov. 13-24 – Rum Renaissance Caribbean Cruise departing from Fort Lauderdale. Dec. 28 – The Mai-Kai 63nd Anniversary Party in Fort Lauderdale. 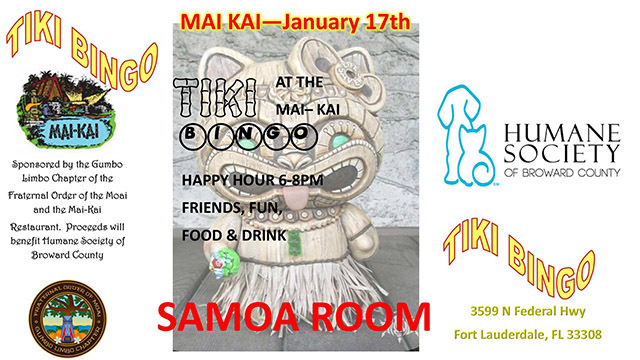 Jan. 12 – The Original Tiki Market Place 7th Anniversary in Garden Grove, Calif.
Jan. 17 – Tiki Bingo at The Mai-Kai in Fort Lauderdale. 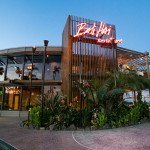 Jan. 19 – The Mai-Kai Takeover in Fort Lauderdale. 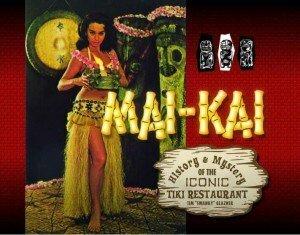 The Atomic Grog was pleased to present a special happy-hour talk during The Mai-Kai Takeover event on Jan. 19, presented by the Magical Tiki Meet-Up and Retro Rekindled. Click here to check out our full event recap, including photos and highlights of our Demerara rum discussion. 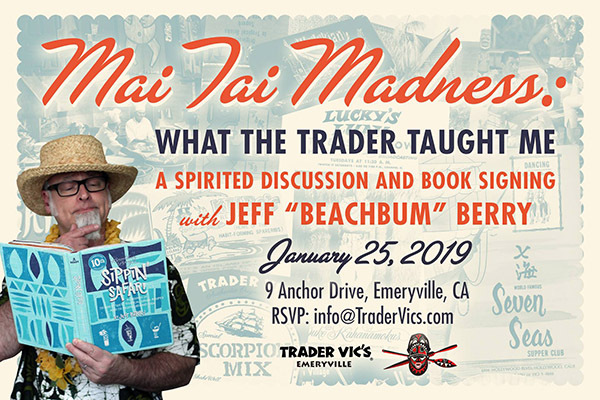 Jan. 25 – Book signing and spirited discussion with Jeff “Beachbum” Berry at Trader Vic’s in Emeryville, Calif.
Jan 26 – Winter Surf Fest in Huntington Beach, Calif.
Feb. 8-9 – Miami Rum Congress in Miami Beach. 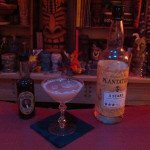 Feb. 15-17 – Inuhele: Atlanta’s Tiki Weekend. 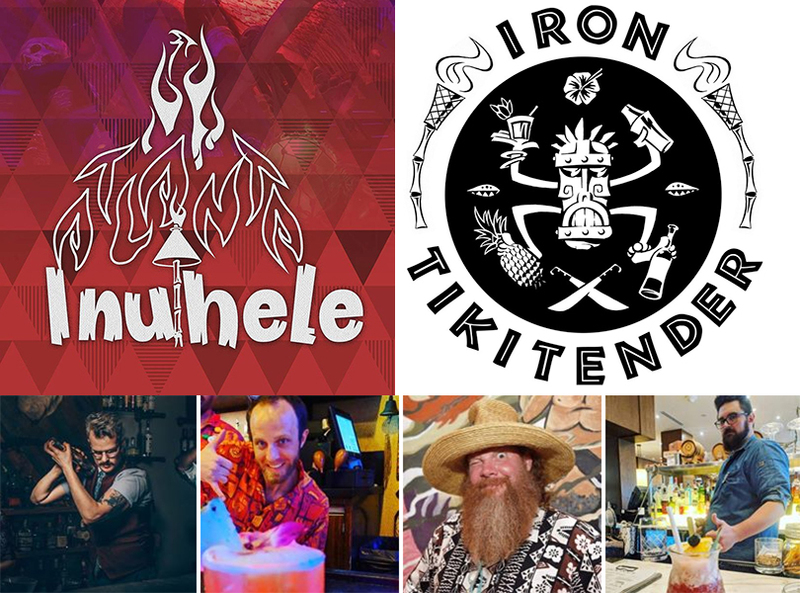 Now, in just its second year, the Tiki weekender known as Inuhele has greatly expanded to include three days of bar-hopping, panels, vendors, bands, demos and more geared to the area’s burgeoning scene. 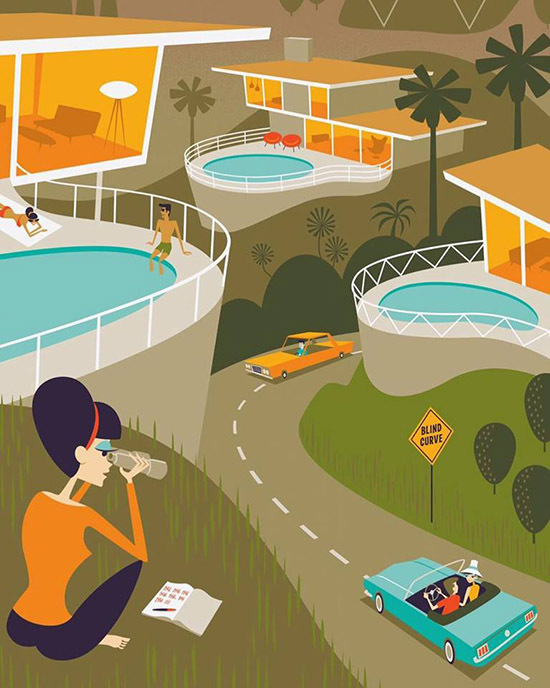 Feb. 14-24 – Modernism Week in Palm Springs, Calif.
Modernism Week saw the official release of Shag‘s latest large print, Blind Curve. 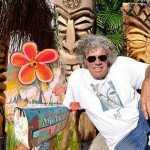 Feb. 22 – Art of Tiki Cocktail Showdown at the South Beach Wine & Food Festival in Miami Beach. Find out how an unassuming chef beat out Miami’s top mixologists in the South Beach Wine & Food Festival’s tropical bartending competition. 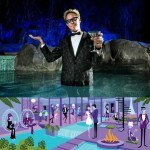 >>> Check out our review of the event and all the cocktails, plus exclusive photos and history of the event. 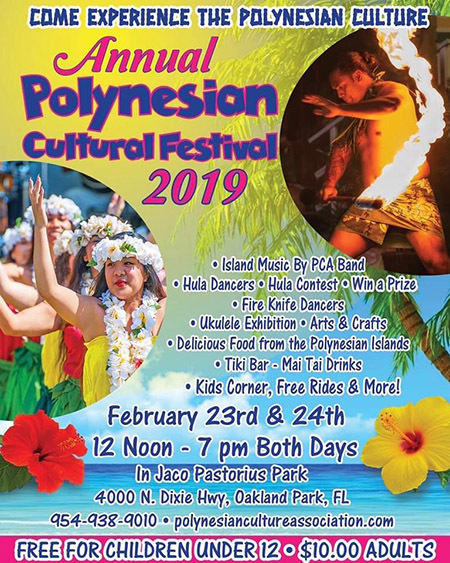 Feb. 23-24 – Polynesian Cultural Festival in Oakland Park, Fla.
March 2-3 – 100 days to The Hukilau Party featuring The Surfrajettes (Saturday) and Retro Rekindled community gathering (Sunday) in The Molokai lounge at The Mai-Kai in Fort Lauderdale. 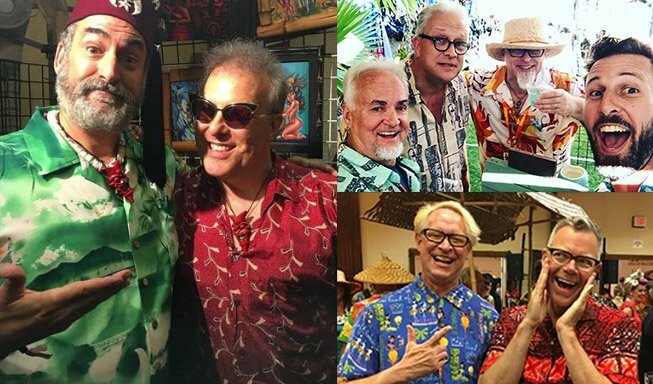 The 18th annual Tiki weekender known as The Hukilau will not invade Fort Lauderdale until June, but local Tikiphiles got an early taste of the rum-fueled festivities March 2-3 when two special events kicked off the 2019 countdown at The Mai-Kai. 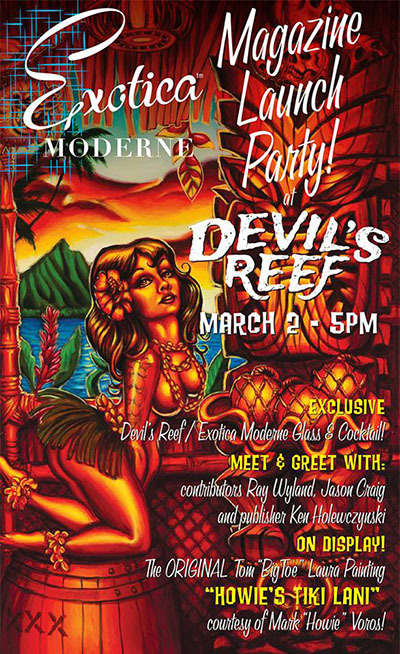 March 2 – Exotica Moderne #3 release party hosted by House of Tabu at The Devil’s Reef in Tacoma, Wash.
March 2 – Taste of Rum in San Juan, Puerto Rico. 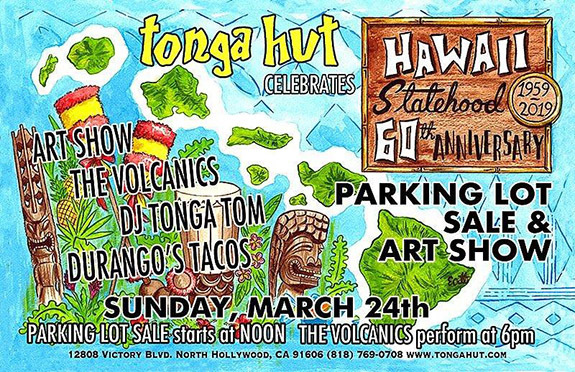 March 3 – Adventureland Day at Disneyland in Anaheim, Calif.
March 9-10 – Arizona Aloha Festival at Tempe Beach Park. 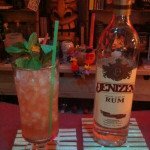 March 9-10 – Jamaica Rum Festival in Kingston. March 10 – Adventureland Day at the Magic Kingdom in Walt Disney World, Orlando. 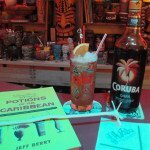 March 10 – Book release party for The Home Bar Guide to Tropical Cocktails: A Spirited Journey Through Suburbia’s Hidden Tiki Temples at Tonga Hut in Los Angeles. First Book Release Party 3/10/19 Tonga Hut. 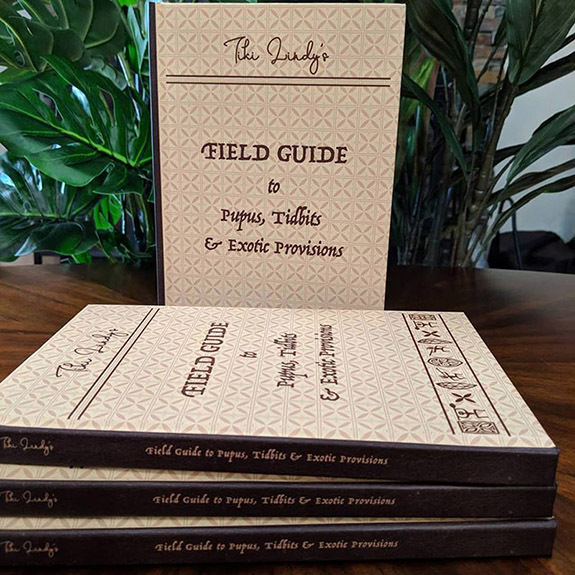 March 18 – Book release party for Tiki Lindy’s Field Guide to Pupus, Tidbits & Exotic Provisions at The Jungle Bird in Sacramento, Calif.
March 24 – Spring art show and parking lot sale at at the Tonga Hut in Los Angeles. 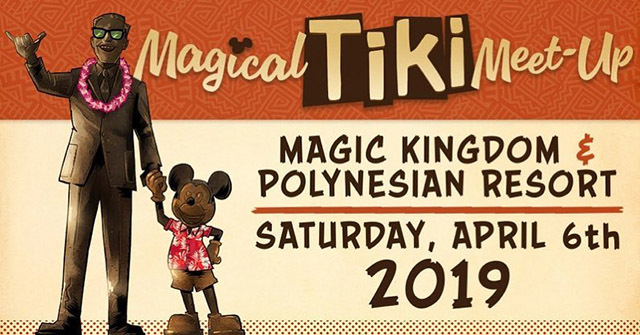 March 31 – Forbidden Island’s 13th Anniversary Celebration in Alameda, Calif.
April 5-6 – Magical Tiki Meet-Up at Walt Disney World, Orlando. 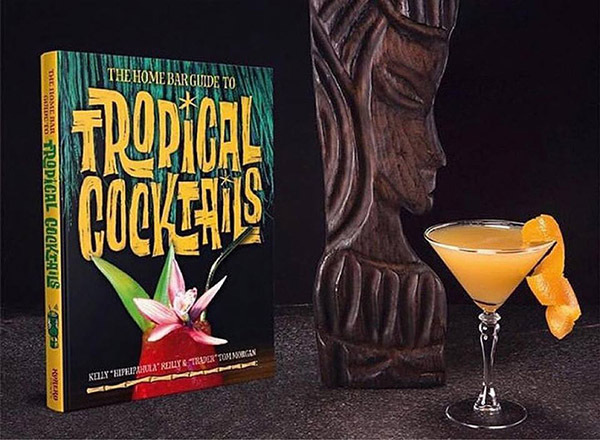 April 7 – Tiki: Modern Tropical Cocktails book signing with Shannon Mustipher and panel discussion featuring Suzanne Long, Jeanie Grant, Michelle Perez and Humuhumu at Trader Vic’s in Emeryville, Calif. Hosted by Ladies Who Tiki. 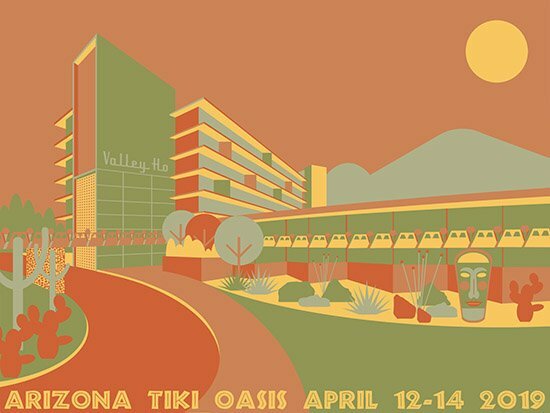 April 12-14 – Arizona Tiki Oasis in Scottsdale. 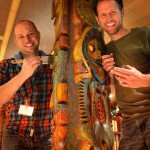 Arizona Tiki Oasis brings all the hallmarks of the original event to a mid-century desert setting, from a vintage hotel to some of the biggest names in the Tiki revival. Had a great time telling some stories at @tikioasis today!! See you all this weekend at the Marketplace!! Aaaaaaaaaaaaaaaaaa -looo -haaaaaaaaaaaa! So many beautifullly dressed and charming guests. 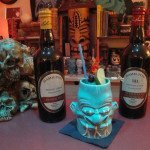 Yesterday’s Tiki Lovers room party was a big success. 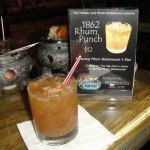 Guests arrived early and the Van Hagen rum punch was very popular… so popular that we ladle soon dived into an dried out punch bowl. Encore! Yes, we will extend the room party here at the Valley Ho another night. 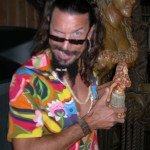 If you are at Arizona Tiki Oasis please visit our secret room party. Do you know the room number? It is hidden in this post. 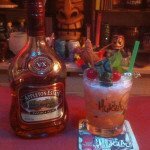 ?#tikio #azto #tikioasis #tikiloversrum #passion4rum #tikilove #rumlove #tikilovers #vanhagenpunch #tikicocktails #westindiesrum #roomparty? 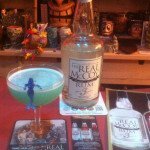 April 13-14 – Rhum Fest Paris. 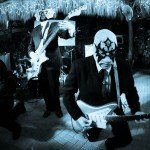 In 2018, The Atomic Grog consolidated previous news and events coverage into a comprehensive 12-month calendar that offers dates, links and previews of all the major Tiki and rum events, plus a touch of modernism, surf music, Disney and other happenings of interest to the Tiki community. We’ve archived the official artwork and links to the official sites. Following events, the calendar was updated to include images and videos culled from social media, along with some of our own photos and relevant press coverage. 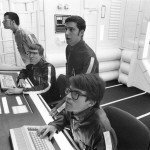 We’ve archived this full year of coverage for posterity. 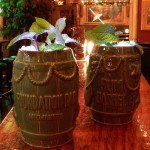 In 2017, we listed many of the major Tiki events across the country, featuring photos and social media coverage. 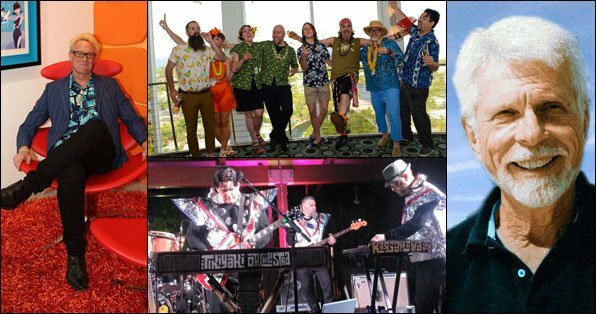 Thoroughout 2015, The Atomic Grog spotlighted the latest news and information on the Polynesian Pop revival and the wide world of retro-themed entertainment. 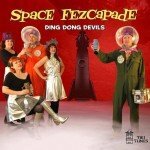 We reviewed and recapped events held every week of the year. 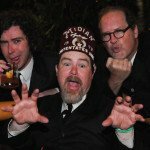 This feature, originally known as The Week in Tiki, covered all the major happenings across the world, with a focus on our home base, Florida and the U.S. East Coast. 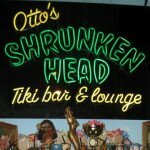 History is a big part of today’s Tiki scene. Legends of the past inspire and provide a template for a new generation of creative individuals. 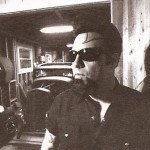 Included in our weekly/monthly profiles are artists, musicians and Tiki locations no longer with us (noted in italics). 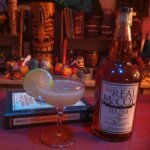 La Floridita Daiquiri featuring The Real McCoy 5 rum. 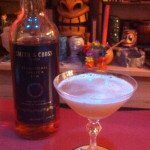 Lost Lake featuring Appleton V/X rum. 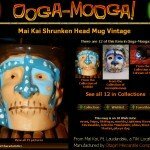 Aloha… In your calendar I didn’t see the Original Tiki market Place listed? Our next event is this Saturday September 8th and also happens to be the 54th Tiki Market Place since we started in January of 2012. 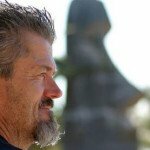 Christopher: Aloha and mahalo for all you do with the Tiki Marketplace! 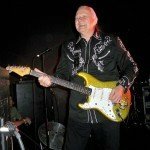 We’ve added several of your upcoming events. Keep up the good work.